In the early 70’s my Father, David, restored a Box Saloon but it never did stop very well and scared the life out of my Mother. This was soon sold and replaced by a 1939 Big Seven Sixlite, registration EDV 144, more space and better brakes! This again was restored, in fact so much time was spent in the garage, bigamy was suggested and the Big Seven was christened “Big-Amy” and put back on the road and used on runs and rallies. 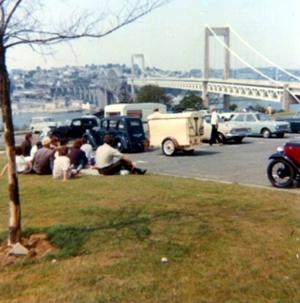 1975 was looming and this was the 10th anniversary of the Cornwall Vintage Vehicle Society, how can we celebrate this occasion? Let’s do the “End to End”. We were going to do this in style; a 1932 Rice Folding Caravan was purchased and tow bar attached to Big Amy. Supplies were loaded - Father, Mother, my middle sister (I have two) and I duly set off from Lands End. Why we went via Plymouth I don’t know but Big Amy suffered terrible clutch slip at Notter Bridge. We got to Plymouth and the Rice Caravan was left at my Nan’s, a tent was borrowed and all the supplies packed into Big Amy. I don’t remember a great deal about the journey, I was only 5. We did arrive late at a camp site one night and had to put the tent up in the dark only to awake the next morning being about 10 foot from a railway line. Oh and we camped on the shores of Loch Ness, I was now sleeping in the back of Big Amy. I was awake most of that night staring out the back window just in case Nessie put in an appearance! 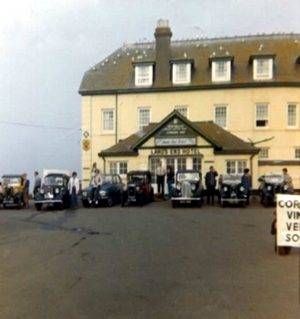 We had on the run a Box Saloon, an Opal, an Open Road, our Big Seven, two Rovers and a Wartburg (back-up car). I think they have all survived to this day apart from the Wartburg! 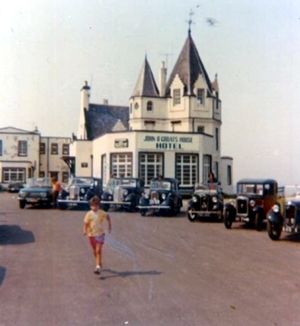 We all duly arrived at John O’Groats a week after leaving Land’s End. Yes that’s me in the photo with the fetching yellow shirt and red shorts. We all got back to Cornwall the following week with little incident, amazing really but does show the reliability of these little cars. Big Amy was sold to a Merchant Seaman in Penryn who had it for many years and then it disappeared. Back to 2018, my wife, Sue, had given me the weekend off to go to the National Austin Seven Rally at Beaulieu, she had to go too. First stop was the Autojumble, next was the cars. Oh a Big 7 we had one like that……. No that is the one! 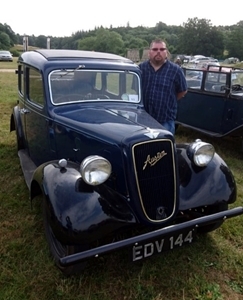 Now owned by an Austin Seven enthusiast, and club member, from Axminster who went to Hull to buy it. A shade of darker blue but that was Big Amy EDV144, glad you are still with us old friend. This article, written by John Doyle, originally appeared in Seven Focus August 2018 pp7-10.